It’s that time of year again as we make final preparations for our children leading up to the SATs. In SATs week is fast approaching and Year 6 are very busy revising and making the final preparations for the tests which are during the week commencing Monday 11th May. We will be providing breakfast for children in Year 6 every day in the week of the tests, starting on Monday 11th until Thursday 14th May. This will take place in the hall from 8.00am each morning. There will be no charge. Simply send your child to school a little earlier in the morning if you would like them to have breakfast. Children work much better during the mornings if they have had a good breakfast and we also believe it is beneficial for the children to have an opportunity to chat and relax with their friends before the tests begin. 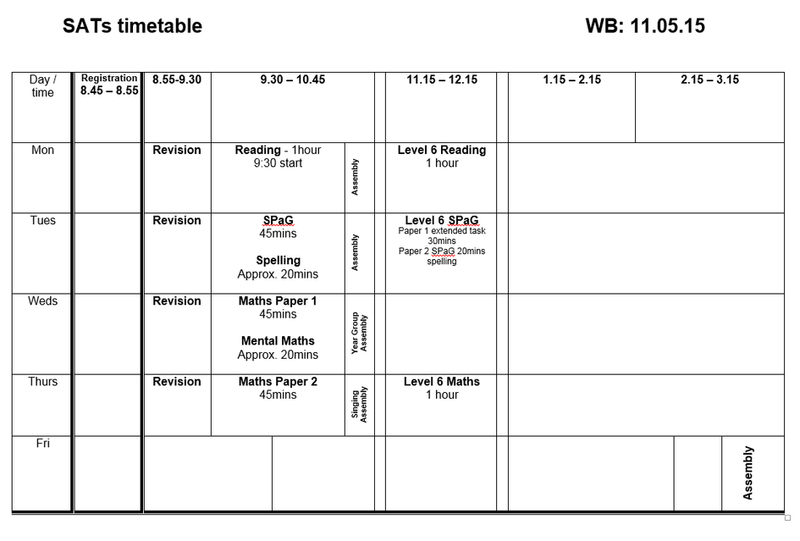 For your information, we have included a timetable for the week below. Please do not hesitate to contact one of the Year 6 team if you have any questions.